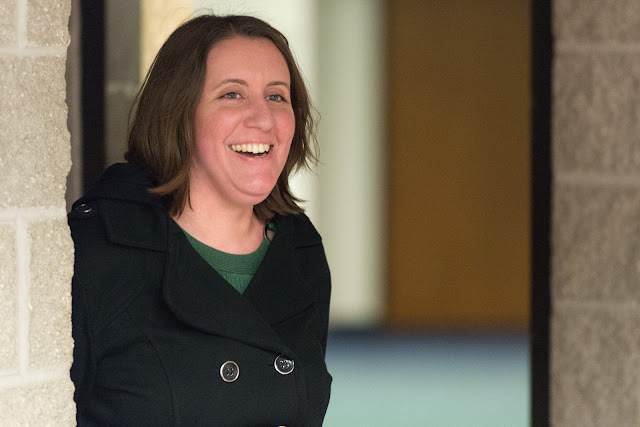 Amy Zepp, a special event facilitator for Sangamon Auditorium, has been named the University of Illinois Springfield Employee of the Month for April 2018. Zepp began working at Sangamon Auditorium as a graduate assistant in fall 2007. Following graduation, she worked in a variety of positions at the auditorium before beginning her full-time role as a special event facilitator in the summer of 2012. According to Zepp’s nominators, she is “thorough and comprehensive” in her work with a strong focus on customer service. She is known for her effective problem solving skills and the ability to resolve issues effectively. “Amy serves as a service provider and ambassador to the campus and community on behalf of Sangamon Auditorium, managing efforts to engage UIS students in our programming, coordinating details for UIS departments who host events in our spaces, and welcoming thousands of school children each year when they attend Class Acts events,” said her nominator. As part of the Class Acts Series, which brings local school children to UIS to watch theatre performances, Zepp regularly travels to local schools to read to children as part of an outreach effort. She also recently helped plan a major Illinois democratic gubernatorial debate in the Sangamon Auditorium’s Studio Theatre, making sure everything ran smoothly. Zepp’s supervisor say she regularly receives compliments about Zepp from other UIS employees who work with her in her event coordination role. Outside of UIS, Zepp is active in her church and plays the clarinet in a local community band. She works part-time in the gift shop at the Dana-Thomas House and is a frequent audience member at community arts events.